So the day has finally come! 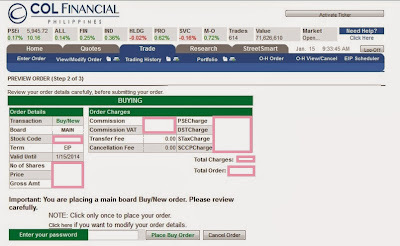 Midway through the third week of January 2014, I finally bought stocks in a property and consumer company. 'Buying stocks' sounded like I'm some rich girl, but please don't get me wrong. I'm only capable of investing an small amount of money since I'm just a newbie in all things investment-related. I will try to share my experiences here in this blog, and would also want to learn from those who are into investing. Days after opening and funding my account, I edited my profile and created my EIP (Easy Investment Plan) Schedule. 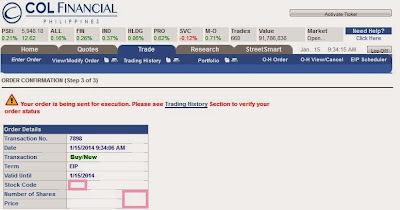 This COL feature sends you an email reminder when it is time to invest your money. 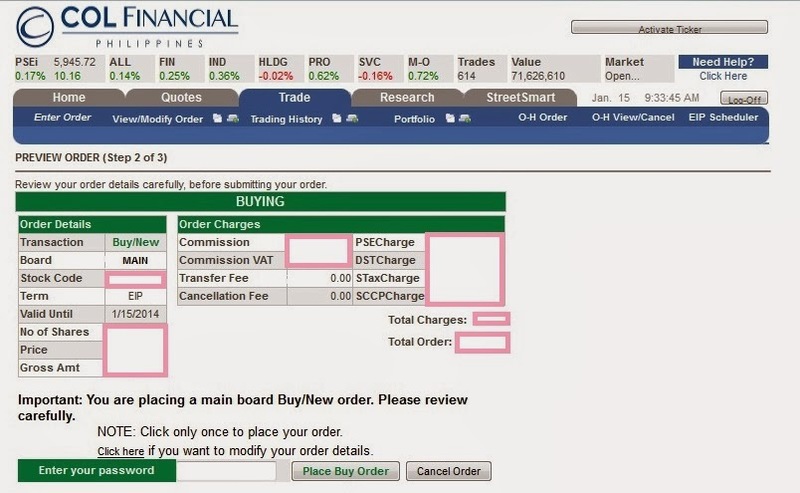 To do this, just go to the Trade section of your COL page and look for the "EIP Scheduler" tab. Fill out the stock code of the company you wish to invest in, and the amount you want to buy over time. 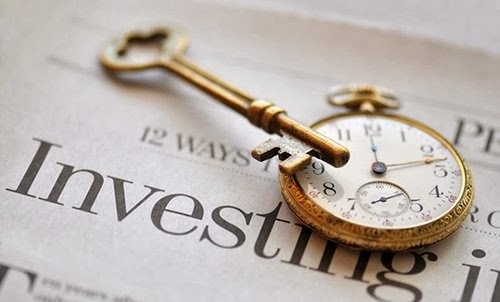 You can schedule your investment every month, depending on the frequency you want (weekly, monthly, quarterly, semi-annually). Select the start date, which will be your regular buy date until your indicated duration- minimum of 6 months, maximum of 3 years. To be safe, I chose the day after payday as my "buy date." For the full tutorial on creating an EIP Schedule, watch this COL tutorial. Now let's say that today is your "buy date." 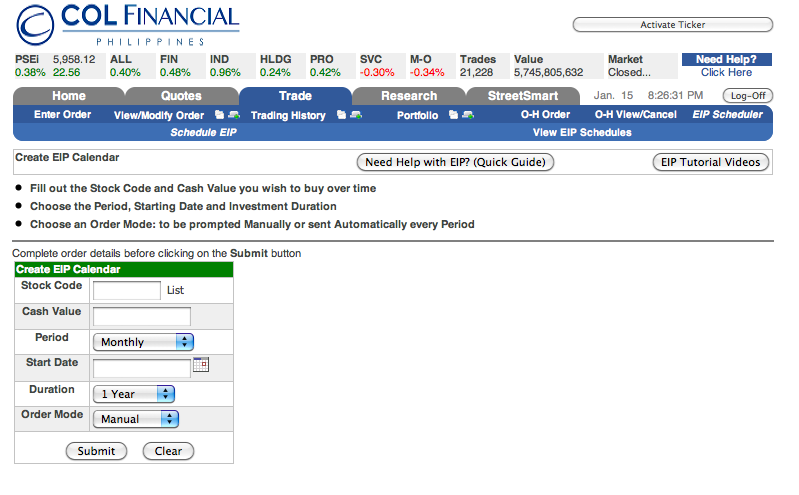 Your homepage should look like the screen cap below when you've signed up for EIP Scheduler. Click "Buy Now" and it will lead you to Steps 1-3. Step 1 will show you your order details. After typing in your password and placing your buy order, Step 3 will show you your order confirmation. For a step-by-step guide on buying stocks, watch this clip. For a quick start-up guide, I suggest watching this video. That's it. 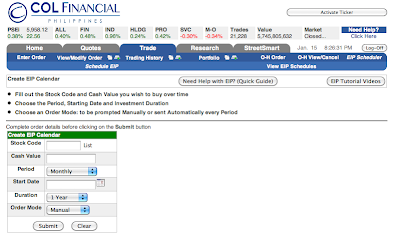 Buying your stocks with the help of the EIP Scheduler function makes it easier. From my understanding, since I'm doing EIP, I need not worry a lot about the ups and downs of the market; but for traders, gains and losses are like a heart attack and aneurysm. My brother once told me how he was not able to sleep for a few days after he lost quite a huge sum of money in stock trading. 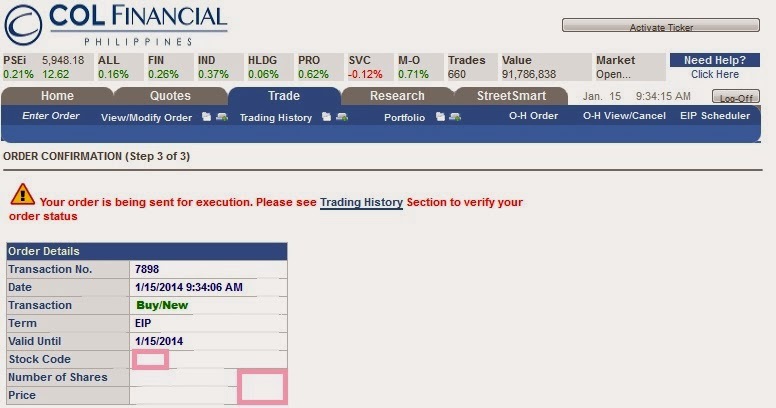 Following his words of wisdom, he told me to just be patient with EIP, and not to try trading if I'm not ready. Noted, Dihia.